North Korea on 23 April issued an unprecedented “notice” in the name of the Korean People’s Army (KPA) Supreme Command Special Operations Action Team. The toughly worded message — a response to what Pyongyang apparently viewed as provocative remarks recently made by ROK President Lee Myung-bak — contained an unusually vague warning against Seoul. 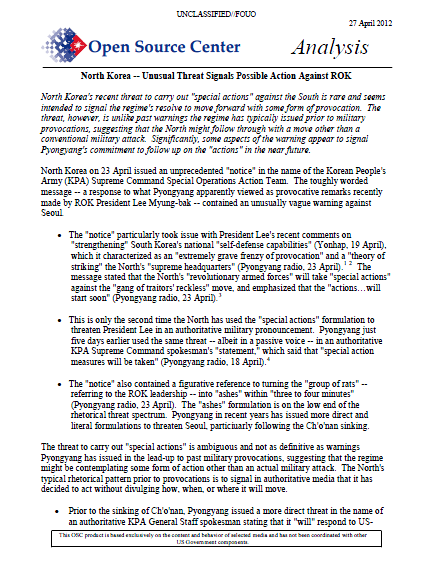 The “notice” particularly took issue with President Lee’s recent comments on “strengthening” South Korea’s national “self-defense capabilities” (Yonhap, 19 April), which it characterized as an “extremely grave frenzy of provocation” and a “theory of striking” the North’s “supreme headquarters” (Pyongyang radio, 23 April). The message stated that the North’s “revolutionary armed forces” will take “special actions” against the “gang of traitors’ reckless” move, and emphasized that the “actions…will start soon” (Pyongyang radio, 23 April). This is only the second time the North has used the “special actions” formulation to threaten President Lee in an authoritative military pronouncement. Pyongyang just five days earlier used the same threat — albeit in a passive voice — in an authoritative KPA Supreme Command spokesman’s “statement,” which said that “special action measures will be taken” (Pyongyang radio, 18 April). The “notice” also contained a figurative reference to turning the “group of rats” — referring to the ROK leadership — into “ashes” within “three to four minutes” (Pyongyang radio, 23 April). The “ashes” formulation is on the low end of the rhetorical threat spectrum. Pyongyang in recent years has issued more direct and literal formulations to threaten Seoul, particiuarly following the Ch’o’nan sinking. The threat to carry out “special actions” is ambiguous and not as definitive as warnings Pyongyang has issued in the lead-up to past military provocations, suggesting that the regime might be contemplating some form of action other than an actual military attack. The North’s typical rhetorical pattern prior to provocations is to signal in authoritative media that it has decided to act without divulging how, when, or where it will move. Prior to the sinking of Ch’o’nan, Pyongyang issued a more direct threat in the name of an authoritative KPA General Staff spokesman stating that it “will” respond to US ROK military drills with a “powerful military counteraction” (Pyongyang radio, 25 February 2010). Similarly, leading up to the Yo’np’yo’ng Island shelling, a statement by the spokesman for the North side’s delegation to North-South military talks warned that its Army “will counter” the South’s provocations with a “merciless physical retaliation” (KCNA, 29 October 2010). Although the recent threat was not as definitive as warnings the North issued in advance of past military provocations, the unusual use of the phrase “will start soon” in combination with the unique “special actions” formulation appears designed to signal that the regime is committed to following through with its warning. Pyongyang’s use of the term “soon” is unusually specific and categorical. The last time the North modified its threat with this term was in a less authoritative North-South Military Talks General-Level Representative “notice,” which warned that its “army will soon” take “corresponding decisive measures” in response to South Korea distributing leaflets to the North (Pyongyang radio, 10 April 2010). Unlike the most recent threat, however, this warning was preceded by a conditional phrase, which afforded the regime the flexibility to refrain from taking immediate action. Further underscoring its commitment to carry out its threat, the North broadcast the KPA “notice” to both domestic and external audiences. In addition, the North Korean radio and television carried the message at least two times a day for three days following the initial announcement.